Easily the biggest guest on the first week of Late Night with Seth Meyers (sorry, Joe Biden), rap phenomenon Kanye West delivered on the hype with a lengthy interview and a medley of hits. First things first, Kanye sat down with Seth Meyers to discuss his fashion ambitions, recall his appearances on SNL and look back on the Yeezus tour. The interview was paired with some seriously cinematic footage from the tour, which has us excited that a concert film could be on the way. 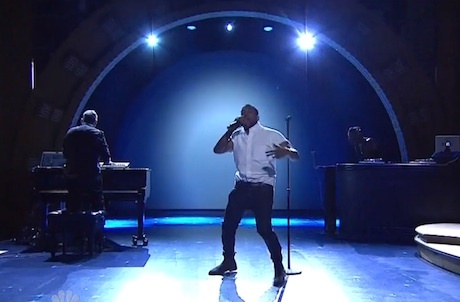 Then, Kanye outdid himself, powering through a medley of hits from "Jesus Walks" to "Black Skinhead." He picked a single from each of his solo albums, throwing in Cruel Summer's "Mercy" for good measure. Check out Kanye West's appearances on Late Night with Seth Meyers below.